I am so excited to share this family room’s Before & After because this client happens to be a dear friend of mine AND this design project was completed remotely! Want to know more about getting design expertise delivered straight to your inbox? Keep reading! Like so many of my clients, my friend is a busy mom. She didn’t have time to source new pieces of art for her family room. Additionally, she wanted my expertise to determine the right size artwork for several spaces within the room. The family room’s vaulted ceiling is a stunning feature of the home. With its modern take on exposed beams and use of industrial-chic overhead lighting, the space has a cool loft feeling. The airiness of the open ceiling is warmed and grounded by amazing dark wood flooring. The result? The space ends up feeling spacious and cozy at the same time. BEFORE: Along its main wall, the space featured two framed photographs that felt disconnected from each other. Along the perimeter of the room, however, the ceiling meets the walls at a lower point due to the pitch. To balance this perspective, I wanted to emphasize a more defined horizontal line that would lead the eye deep into this spacious area. After an initial consultation, I presented my friend with several options based on her interior design style. She chose three modern fine art prints by the Connecticut based artist Julia Contacessi. The second area that we wanted to focus on in the family room is the wall space between their television and the opening that leads down to the home’s office and playroom. Due to the placement of the couch, the family spends a good amount of time facing what had been a previously blank wall. The space here is big enough that it definitely needed a design focal point: a strong enough piece that could hold its own when the television is on, but also draw the eye away from the television when the screen is off. That piece turned out to be Indigo Mountains, a fine art print offered through the on-line art collective, Society6. This modern mountain landscape, with its pleasing gradient color scheme, is the perfect complement to Julia Contacessi’s dreamy abstractions. Through photographs sent via e-mail, I was able to help my friend from afar. I gave her multiple options that could work in each space and went over the selections that she was most drawn to. The Goal? She could make the ultimate selection with confidence, knowing that each of the pieces would look fantastic in her space. This project was so much fun to work on and most importantly, the clients are thrilled with the results! 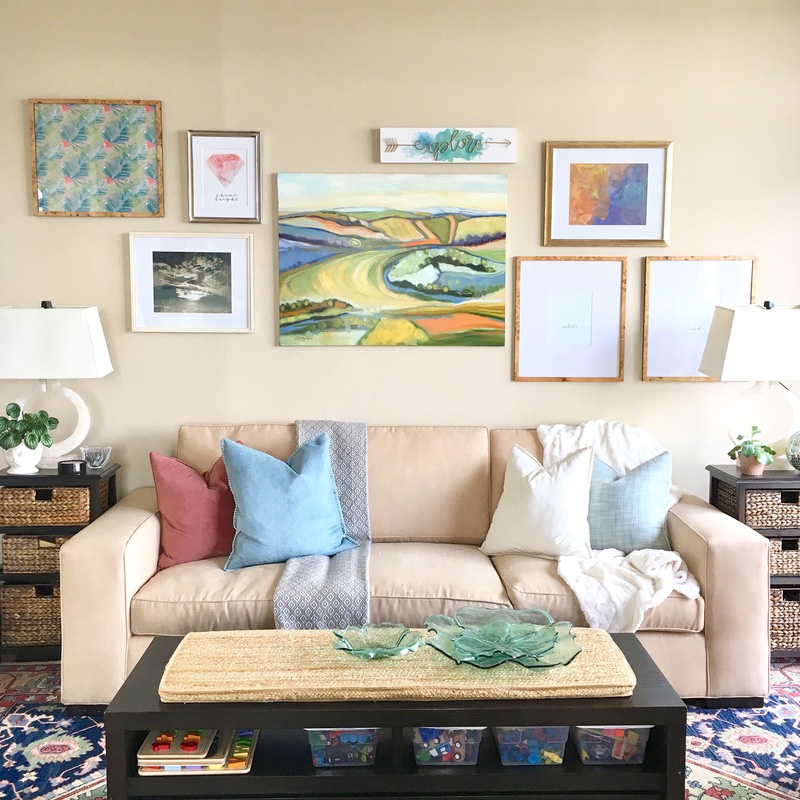 Need help choosing artwork for your family room? This is Art Consulting for the Real World! This post contains a Minted affiliate link (for the art print Linen Coast) and I will receive a small compensation (at no additional charge to you!) if you make any purchases after clicking on this link. Thank you for shopping small and supporting an independently owned business – Lauren Heller Art Consultant!